How to Get to Women's Studio Center. to many subways, buses and highways. FOR FED EX, UPS, DHL, POST OFFICE, ETC. Walking: Go to Exit at this station that says 21st Street 44 Drive. (Hint: if you're coming from Manhattan get on the back of the train. If you're coming from Queens get on the fronto f the train). Go up the nearest staircase and you should be on 21st Street facing the East River and the Manhattan Skyline. Make a left and walk two blocks to 44 Avenue. (You will be on 44 Drive and pass 44 Road before you get to 44 Avenue). Cross 44 Avenue and make a right. You'll see an awning and that's us. Walking: Follow signs in the station for the E and V Train and go out the exit at the other end of the E or V Platform that says "21st Street/Ely Avenue" Follow directions for above. Walking: When you get past the turnstiles in the subway station make a right and go down the nearest staircase. You will be on 45th Road. Walk straight ahead (towards the East River) one block until you get to 21st Street. Make a right and walk 5 blocks until you reach 44 Avenue. (You will pass 44 Drive, 44 Road before you get to 44 Avenue) Cross 44 Avenue, make a right and you'll see an awning and that's us. Switch at Queensborough Plaza for the #7 Train going towards Manhattan. Take the 7 to 45th Road/Courthouse Square ( one stop) and follow walking directions above. Walking directions are complicated - please try to switch to one of the above trains or call us: 718-361-5649. Walking: When you get to the sidwalk, walk towards and under the 59th Street/Queensborough Bridge. Walk two blocks further (on 21st Street) until you reach 44 Avenue (you will pass an exit from the bridge, Silvercup Movie Studios and 43rd Avenue first). Make a left on 44 Avenue and you'll see an awning and that's us. Note: Try to switch to another train if you're coming at night. Check these web sites for details and schedules. Take it to 21st Street Exit. Make a left and go two blocks until you reach 44 Avenue. Make another left and you'll see an awning and that's us. Turn left and make the next available left. Go until you reach 21 Street. Make another left and go straight down 21st Street until you reach 44 Avenue. (You'll pass under the Triboro, Hells Gate Train Bridge and the 59th Street Bridge. 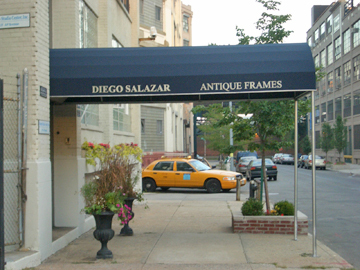 Make a left when you get to 44 Avenue and you'll see an awning and that's us. Throgs Neck Bridge - to Cross Island Expressway, to Whitestone Expressway, to Grand Central Parkway/ Hoyt Avenue Exit 13. Follow above directions for the Triboro Bridge. (Instead of first two lefts make a right under the subway tracks). Follow directions for Throgs Neck and Triboro Bridge. Long Island Expressway West to Exit 15/Van Dam Street. Make a right onto Van Dam Street and take Van Dam to Thompson Avenue (right before the elevated subway)and make a left. Take Thompson Avenue to the end and make a left onto Jackson Avenue. Go to 21st Street and make a right (you'll see an Amoco Gas Station & P.S. 1 Contemporary Art Center). Go up 21st Street until you get to 44th Avenue. Make a right and you'll see an awning and that's us. Get off at Hoyt Avenue, just before the Triborough Bridge. Go to the right of the bridge and past it (on Hoyt Avenue) until you reach 21st Street. Make a left and go all the way down until you reach 44 Avenue. (You'll pass the Triborough and 59th Street Bridges). Make a left onto 44 Avenue and you'll see an awning and that's us. - Pollaski Bridge to Jackson Avenue. Make a right on Jackson Avenue and go to 21st Street. Go approximately five blocks until you reach 44 Avenue, make a right and you'll see an awning and that's us.